Herring roe, or caviar, which is known as “kazunoko” in Japanese, is a delicacy that is served on January 1st to celebrate “oshogatsu” or New Year. Kazunoko is considered a traditional Japanese New Year’s dish or "osechi ryori". As such, this dish, like other dishes served on oshogatsu, has valuable meaning attached to it. For example, eating kuromame, or simmered black soy beans, is fortuitous on oshogatsu, because the beans represent well-being and wishes for good health in the New Year. Similarly, kazunoko, or roe, represents fertility, eggs, and children. Eating kazunoko on Japanese New Year symbolizes the wish for many children or grandchildren in the year ahead. This dish of herring roe is lightly seasoned with kelp (konbu) dashi, bonito (katsuo) dashi, and soy sauce (shoyu). There is no cooking involved, with the exception of mixing ingredients together and allowing the herring roe to marinate in the light dashi broth. The only caveat of preparing this dish is that the membrane surrounding the caviar must be removed so that the flavors of the dashi can be absorbed. It is also removed for aesthetic purposes, given the dish is served on a special occasion, the presentation is important. Other dishes that are enjoyed on Japanese New Year, or oshogatsu, include: black soy beans (kuromame), sushi, sashimi, and sweet red bean dessert soup (zenzai). Soak fresh kazunoko in cold water for two days, changing water once daily. Store in the refrigerator. This removes the salt from the roe, as well as to loosen the membrane surrounding the roe. Gently remove​ the membrane from the kazunoko pieces. There is a very thin membrane you will notice after about one day of soaking the kazunoko in water. 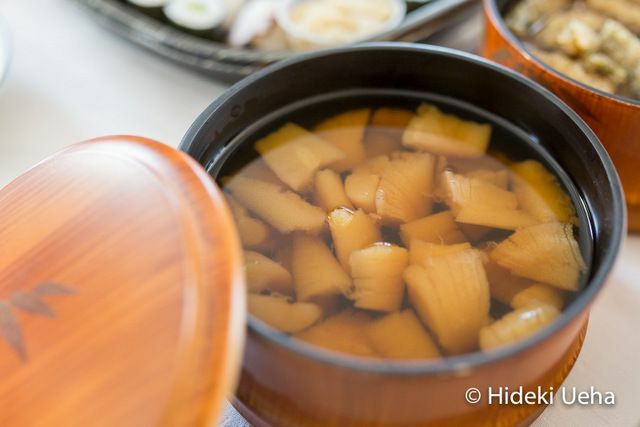 In a small pot, soak dashi konbu in water for about 1 hour. Bring dashi konbu and water to a gentle boil. Add dried bonito dashi and soy sauce and simmer for about 10 minutes. Allow the cooked broth to cool. Discard dashi konbu. Gently break apart kazunoko into bite-sized pieces using your hands. Do not cut. Place the pieces of kazunoko into the dashi broth and place in the refrigerator 1 to 2 nights while the roe absorbs the flavor of the dashi.